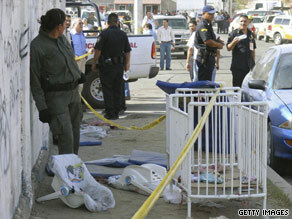 HERMOSILLO, Mexico (CNN) -- Thirty-one children were killed and more than 100 others were injured Friday when their day-care center caught fire in the northwestern state of Sonora, a spokesman for the state's governor said. A crib and baby seats lie outside a day-care center where the deadly fire broke out Friday. The victims were from 1 to 5 years old, said Jose Larrinaga, the spokesman. The fire appeared to have started at 3 p.m. in a warehouse next door to the one-story concrete building that housed the state-run ABC Daycare and spread to the state-run institution, news reports said. By then, many children had already been picked up by their parents from the one-story building. But others came after the blaze had been put out, with parents screaming their children's names as others fainted. In a message of condolence, President Felipe Calderon wished a quick recovery for the injured, who were taken to several area hospitals. He also called on the nation's attorney general to investigate the fire. Admissions will begin Saturday, said Catherine Curran, a spokeswoman for Shriners Hospitals for Children in Sacramento, California. Shriners Hospitals is a health care system that gives children free treatment for burns, spinal cord injuries, orthopedic conditions, and cleft lip and palate, according to its Web site. It admits children under 18. The first hospital opened in 1922. The system has burn units in Boston, Massachusetts; Cincinnati Ohio; and Sacramento, California. Journalist Guadelupe Gutierrez contributed to this story.